At Northern Hideaway you will experience a different type of upland hunting than what is found in other parts of Maine. Due to our remote location some grouse never see a hunter. 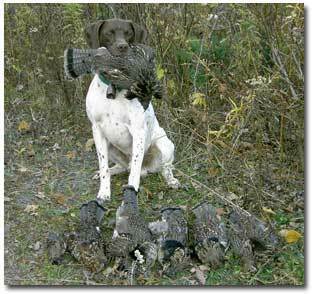 The grouse, or partridge as it is known locally, will more often than not sit tight even for an inexperienced dog. Our grouse population remains healthy year after year. 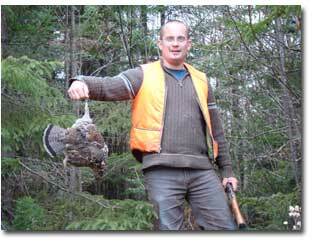 Often our worse grouse production years equal some areas of Maine’s best production. Our covers are primarily new growth created by commercial wood harvesting operations. Our area also has river and stream bottoms with the classic alder and poplar growth that is conducive to both grouse and woodcock. Our location boasts a healthy native population of woodcock. We see these birds all through bear season. We are also located on a major flyway coming down out of Quebec. The St. John River Valley along with the many cuts offers a stop over for migratory birds. Good woodcock hunting can be had all season. 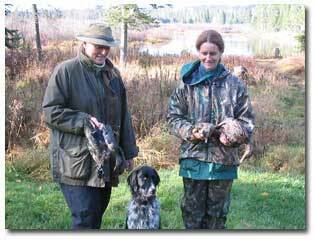 Northern Hideaway also offers combination hunts for duck and upland game. 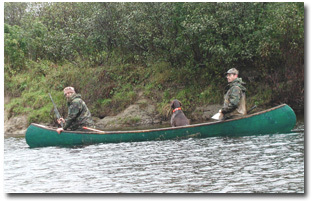 A hunter can hunt ducks at first light each day on the river in front of the camp. Return to camp for breakfast and then take to the grouse and woodcock covers for the remainder of the day. Our primary duck is the ringneck duck followed by the black duck. We also see a fair amount of teal, wood ducks and occasionally mallards. Two species of geese are always a possibility as well.